There was time in Indian innings when 5 players including captain MS Dhoni were sitting in dressing room and scoreboard was showing just 93 runs in reply to the Proteas total of 220 runs. In came Yususf Pathan and blew away the South African attack with his hurricane innings and opened the door for Team India to win the match from virtually impossible situation. Although Pathan got out when India was in delicate position but Bhajji finished the job with the help of Nehra and Zaheer and sealed the victory for India. Pathan declared Man of the Match in his first game in South Africa after cooling his heels in dressing room during the first 2 ODIs. He has also hinted to MS Dhoni about the big error which Dhoni had committed by not playing him in first two ODIs. India bowled out Proteas for 220 runs after losing the toss and it was Zaheer, Harbhajan and Munaf who did fantastic job by restricting Proteas. Proteas kept losing wickets at regular intervals but one steady partnership of 110 runs between JP Duminy and debutant Faf DuPlessis helped South Africa to post respectable total. I must say DuPlessis really played very well under pressure and scored brilliant half-century.DuPlessis was the dominant partner in that partnership and it never looked like that he was making his debut in this match. South Africa really found a great talent in DuPlessis. DuPlessis replaced Miller in this match and justified his selection. Smith played scratchy innings of 43 at the top before getting out but apart from Smith, Duminy and DuPlessis, none of the South African batsmen succeeded in making any impact. I must give credit to the Indian bowlers especially Zaheer, Harbhajan and Munaf as they bowled brilliantly and never allowed Proteas to get off the hook. India opened with Rohit Sharma and Murali Vijay. Rohit looked scratchy in this innings and never looked comfortable even after spending reasonable time on the crease and finally got out on personal 23 runs. Vijay failed once again and increased the pressure on rest of the batsmen. Raina played good hand of 37 and did crucial partnership of 70 odd runs with Yusuf Pathan which helped India in consolidating their position after poor start. Although Raina panicked bit early and threw his wicket. Morkel, Steyn and Tsotsobe bowled very well especially Morkel was virutally unplayable throughout the match. He bowled superb line and length. 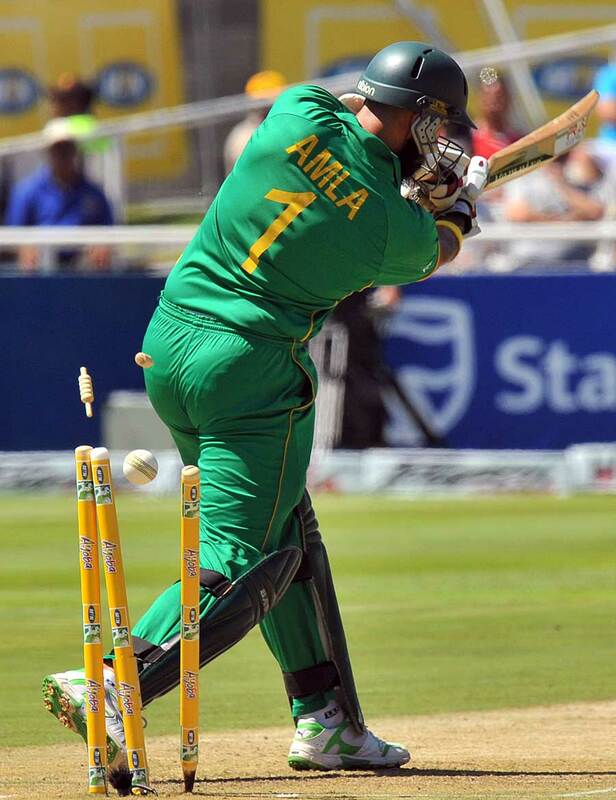 He used his height very well in extracting bounce from the low wicket. Botha bowled very well till that one over in which Yusuf Pathan took him on and hit 3 sixes and accumulated 19 runs. Botha will not forget that over for long time and I feel that over proved turning point of this match.Parnell also failed to impress his captain as he bowled poorly. Over all India did very well in the match but for them worry is the form of their top-order batsmen. Kohli played one good knock so far, Yuvraj is also sailing in the same boat as Kohli. Raina till date failed to play big innings on this tour so far. So plenty of problems in store for Dhoni and needs to be rectified if India wants to win the series in South Africa for the first time. 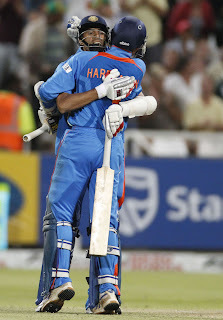 Although India is leading the series 2-1 but not to forget both the matches they won were very close. So team's think tank have to do some work on the batting of our top-order batsmen otherwise I will not be surprised if India lose this series after leading it. Well what to say about Murali Vijay. I feel he is immensely lucky to be in the team due to the injuries to our main player. I believe he don't have any future in International Cricket. He is in the team till now only because of the Chairman of Selector's love for him as both of them hails from same zone, state and city. There are lot of talented players in our domestic cricket and they are not getting much chances or seldom they get the chance then they are dropped after one or two failures or lose their place because of players like Murali Vijay who keep getting regular chances even after failures. We have talented players in Robin Uttahppa, Manish Pandey, Saurabh Tiwary, Bhubneshwar Kumar, Abhishek Nayar and list continues but these players always overlooked and thats the great irony of Indian Cricket because Indian Cricket is in trap of zonal bias and quota system. I give example of Saurabh Tiwary, this guy did very well in whatever chances he got in International cricket yet he is out of the team. few percent to force the message house a bit, however instead of that, this is great blog. as this occasion i am reading this fantastic informative paragraph here at my home.